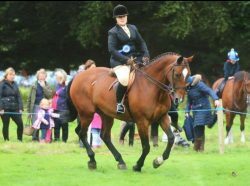 October sees Storm Surge take the national prize in the elite ROR BSJA league cashing in £500 for 6th place , he is fed a well balanced diet along with the Mobility Balancer in which I’ve seen a massive change in his movement and well being since feeding it. I have been so pleased with his achievements this year, especially as ex race horses have such a bad press but to be honest there the best competition horses for all levels if you can find a good one! I’m lucky enough to have found another as well recently who has just stared his retraining and has picked up a few placings already! It’s not only competing that gives me satisfaction but helping others achieve goals and giving people confidence is another reason I love my equine friends. Just recently I’ve help turn around a nervous client and her horse back to winning ways and introducing them to other things other than just jumping. Jenny Little contacted me to help her with her horse Huckleberry Finn a few months ago as he was becoming naughty and nappy and together we’ve got him and herself fighting again and in the right direction. She’s taken up showing and dressage since joining me and I’m thrilled with their progress. Finn is fed on the Original Balancer most days as he suffers from boredom when stabled and he loves them !